For the past few years, we’ve spent our wedding anniversary in different cities. Last year, we celebrated with a whirlwind visit to Chicago in the middle of a big road trip. The year before that, we spent it in New York City. This year, we stayed closer to home and decided to explore the real wild west coast: Tofino & Ucluelet. Cornelius had visited when he was a kid, but I’ve never been because it’s kind of a hassle to visit. There’s a 2 hour ferry ride and a three hour drive along gorgeous but super twisty, narrow roads. Since we only bought a car last year for the first time in my adult life, now seemed like the perfect time to go! We spent most of our time hiking the various trails and wandering down the immense beaches in Pacific Rim National Park between Tofino & Ucluelet (check out our photo set). While the weather wasn’t the best – lots of mist, wind and grey skies with small bouts of rain, it was as magical as everyone says it is. We got up early to explore tidal pools where we saw sea stars (that’s starfish to you old timers) in vibrant oranges and purples, sunflower sea stars, sea anemones, jellyfish, barnacles and climbed around rocks and walked across miles of sand. And the forests were amazing! So verdant and lush with giant sitka spruce and red cedar trees, moss, and ferns. And I even got to see a bear for the first time! Twice – once from the car and a few hours later, we spotted another one off the trail we were hiking on. We watched surfers catching waves and made a lunch stop for amazing fish tacos and spot prawns. It was a wonderful way to spend our 8th anniversary and I’m already wondering when we can head back. A few days before our trip, I decided to make some cookies. I wanted them to be a special anniversary treat since I wasn’t going to be baking a cake while we were hunkered down in our rented tiny cabin. So, I made these on a Friday afternoon and when Cornelius came home that evening, he declared them his favourite cookie ever. He also proceeded to whittle down my precious supply of 12 cookies into the single digits. The next day there were no more cookies left. They didn’t make it for our trip, but no matter, as they were clearly enjoyed. These jammy thumbprint cookies reminded me of packaged Peak Frean Fruit Cremes from my childhood. But a million times better. The cookie is buttery, but not too buttery. 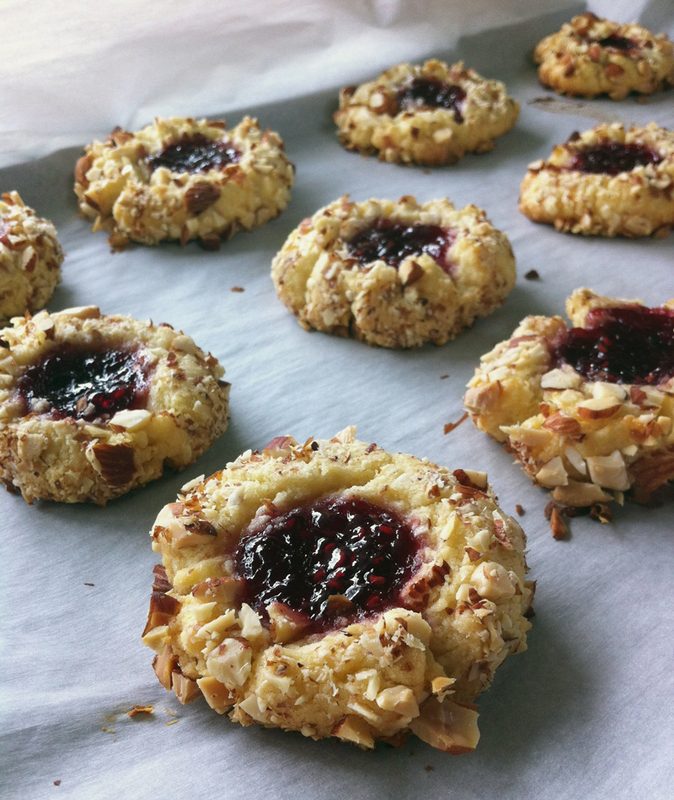 The almonds give maximum crunch, while the raspberry jam is still luscious but somehow after baking the flavour and texture seems enhanced. Not only is it a delicious cookie, but it’s a beautiful sight to behold. I dunno if there is a more romantic cookie out there. Bake up a batch today and spread the love. Better make it a double batch! Scoop the dough and roll into small sized golf balls with your hands – this is where your possibly crumbly dough will come together. You should have about 12 balls in total – the original recipes says 15. Whatever. Using one hand to roll each dough in the egg white and then use your other hand to roll that dough ball into the almonds. Set onto a silpat or parchment covered baking sheet. Using the stem end of a wooden spoon (or your thumb), make an indent into each cookie. Use a 1/2 teaspoon spoon to fill with raspberry jam. Bake for 12-15 minutes or until lightly golden. Cool on wire rack. 1 cup vanilla! Please say this is a miss print. Ha, yes, Barbara, thanks for the catch!! Fixed. 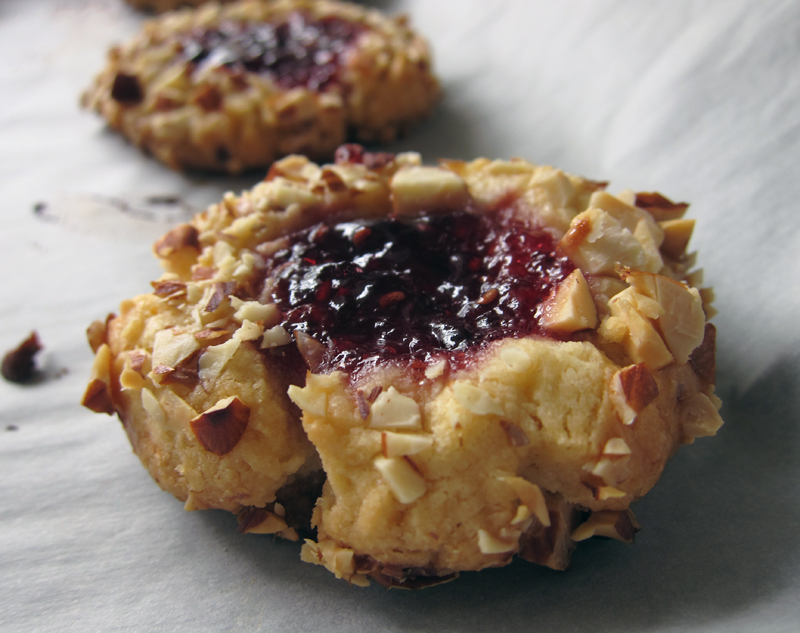 Hey J, you wouldn’t know this but I’m a fiend for jammy thumbprint cookies. I’ll make this recipe for sure! 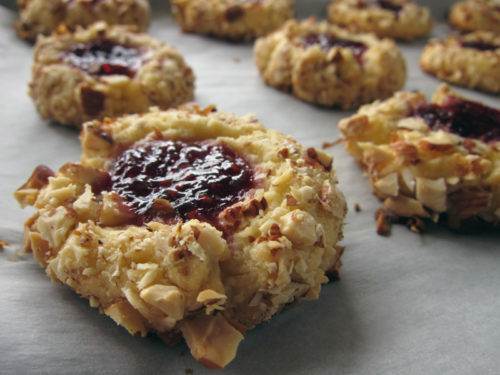 One question: other recipes specify to pull the cookies out of the oven, when they’re half-baked, to re-press the indent and only then add the jam (then return to the oven to finish baking). 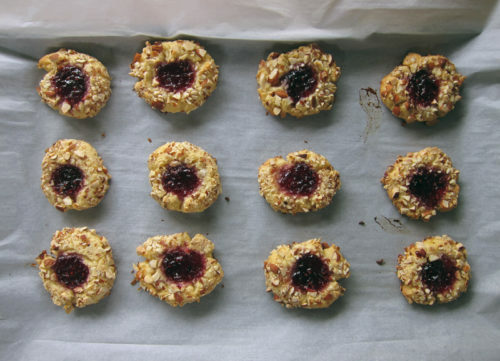 With the jam going into the hole right away in your recipe, does the centre of the cookie bake properly, or does it stay a bit doughy with all that wet jam up against it? Craig, I have another recipe where you add the jam midway as well. This works so much better because the jam cooks a bit and gets a wee bit gummy around the edges which is delightful! The cookies are totally baked up, no fear there!! (also your question did sound a leetle bit dirty!!) 😉 Nice seeing you here, friend! Stephanie, yes, definitely hide them!!! They will be eaten up quickly! HAHAHA. I just reread my question and it totally sounds filthy about midway through. I was just so focused on my question that I didn’t even notice. Ok, thanks for confirming. I love how straightforward your recipe is and can imagine how the jam will transform (deliciously!). 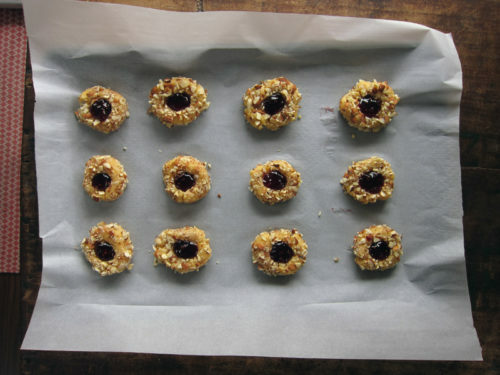 May become my go-to Christmas thumbprint cookie recipe, so thanks! Sounds like you had a magical time! And these cookies look delicious; made with love and shared with your loved one. Beautiful. Sounds like a wonderful anniversary trip!! And the cookies must have been amazing if they disappeared so fast! I don’t blame Cornelius for devouring these beauties! I mean, look at them. What’s not to like? I’m sure my husband would follow suit. Loved looking at your Tofino & Ucluelet photos. The scenery is breathtaking and looks like such a paradise where the ocean is brimming with life. The only trips we’ve made together since getting married 6 yrs ago is Montreal and Ottawa. Except for the trips I’ve made to Greece a few times with my mom but that doesn’t really count. Fingers crossed we can make it to Oregon this Autumn. Thanks Craig!! When you do get to try them, let me know what you think! Yup, Joanne, they didn’t last long at all. Bijoux, it was an amazing trip and I can’t wait to visit again. A trip to Oregon? Sounds exciting!! I hope you can do it and spend a bit of time on the west coast too. Thanks Nicole for the recipe! Yes, our anniversary is June 25th – very close indeed to yours! These are my daughter’s favorite cookies ever – I’ve tried various jams in the centre, but family consensus is with crabapple jelly as the best – your cookies look fabulous. My mother taught me this recipe about 60 years ago! Ah, maybe it’s my Canadian butter then, Robert F. The baked cookies held up well and I’m glad you enjoyed them. Hiking around Glacier sounds pretty wonderful too! 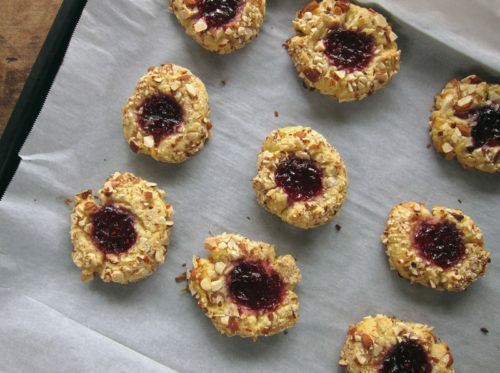 I was looking for a raspberry thumbprint recipe to make for my husband. He talks about having these cookies as a child when visiting his grandmother in New York. I made this recipe for him, and he said it was even better than that bakery. Thanks!! Hi I just made these cookies. The dough was perfect, not crumbly at all, although the first batch came out a little burned on the bottom, could be my oven, but they were delicious & didn’t taste burnt at all. Next batch I took them out a bit sooner & was worried cuz they were kinda soft, but when they cooled off they firmed up. I used my homemade raspberry jam & it kinda spread out. But like I said, still delicious. Will def be making them again!